First off, I have to confess that I’m a little biased. I love Woody Allen. If a movie is written and/or directed by Woody Allen, I will go see it, and probably love it. Combine that with my love of Paris, and this film could almost do no wrong. Midnight in Paris is the story of a wide-eyed optimist, Gil Pender (played by Owen Wilson), who has settled for what is easy and convenient, but dreams of something more. With a quirky touch of magical realism, as only Woody Allen can achieve, Gil is transported from present-day Paris to different romantic eras that were high points in art and culture. The film is superbly written and brilliantly directed by Woody Allen—it did win the Academy Award for Best Original Screenplay, and garnered several other awards and nominations. In addition to solid performances by the main players—Owen Wilson as Gil, Rachel McAdams as his fiancée Inez, and Marion Cotillard as the alluring Adriana—Midnight in Paris is a veritable cornucopia of great actors playing great artists: Tom Hiddleston is F. Scott Fitzgerald, Kathy Bates is Gertrude Stein, and Adrien Brody is the Surrealist painter Salvador Dalí. Book lovers, art lovers, and film lovers all have ample opportunity to geek out during the movie. 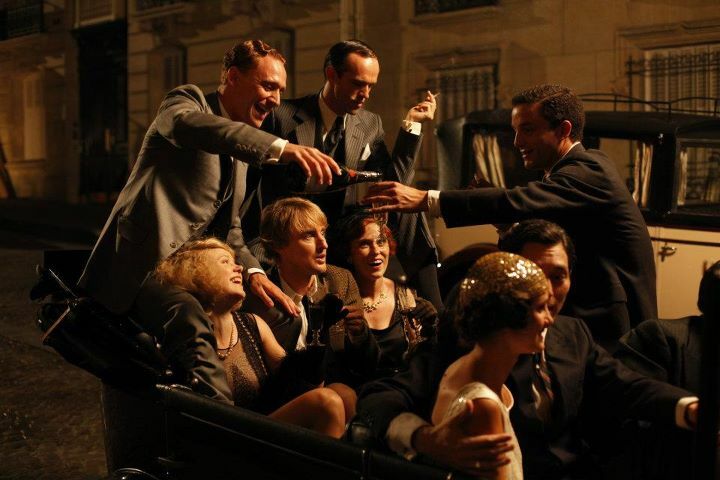 Filmed on location in Paris, Midnight in Paris is also visually stunning—from the opening montage of present-day Paris, to the recreation of cultural hotspots from the 1920s and the 1890s, it’ll make you want to pack your bags (I may or may not check the fares on Air France every time I watch this movie). We meet Gil (Wilson) and Inez (McAdams) as they are visiting Paris from Los Angeles. The character of Inez, Gil’s fiancée, is almost a foil to himself. Gil loves everything, and Inez hates everything. Gil wants to explore, assimilate, and drink in his surroundings, while Inez and her parents are the worst sort of tourists: they hate the culture, they hate the people, they hate the food, and they have no interest in allowing their worldview to be broadened beyond their shallow LA lifestyles (the term “ugly Americans” is brought to mind). Gil is a discontented Hollywood screenwriter who would rather be a novelist, but his life changes when he gets lost walking the streets of Paris at midnight, and a car from the 1920s pulls up and transports him back in time. Basically Gil has settled for what the world tells him he should want—fame, fortune, and a stable yet unfulfilling job. Rather than break free of the cage he has built for himself, Gil dreams of living in a different time—in the 1920s. He views that era as the Golden Age of art, literature, and culture, and is fixated on a fantastical version of the past. As one of the characters (I call him “Pretentious Paul,” played by Michael Sheen) points out: “Nostalgia is denial of the painful present.” He accuses Gil of “Golden Age thinking,” and defines it as “the erroneous notion that a different time period is better than the one one is living in.” While I hate to agree with Pretentious Paul, the notion is indeed erroneous. Gil’s wake-up call comes when he and Adriana (Cotillard) are transported to La Belle Epoque—to Paris in the end of the 19th century. Gil sees his ideal woman from his ideal era longing for another time, just as he does. When Gil and Adriana meet Henri de Toulouse-Lautrec, Paul Gaugin, and Edgar Degas, Adriana speaks of La Belle Epoque as the height of art and culture, but Gaugin argues that his time is anything but a Golden Age. Gil realizes that they are all chasing an illusion. The danger of longing for an illusion or fantasy is that it detracts from dealing with reality. For Gil, this meant wishing he lived in the Roaring Twenties instead of making changes in his life in the here and now (thankfully he learns his lesson). Gil was discontented with his life, and rather than take practical steps to change his circumstances and live his real life to the fullest, he distracted himself with dreams of an illusory Golden-Age fantasy world. In his book Mere Christianity, C.S. Lewis points out: “If I find in myself a desire which no experience in this world can satisfy, the most probable explanation is that I was made for another world.” The desire for a better world is natural—it’s knitted into our DNA. Humans are eternal beings living in a finite world, “But our citizenship is in heaven” (Philippians 3:20). As we look forward to a new heaven and a new earth (2 Peter 3:13), we can still live fulfilled earthly lives in an imperfect world. Dreaming of a full life should not replace living life to the fullest. Good review Amber. It was a surprise that Woody Allen had such a lovely little piece of delight like this still in him. I definitely want to see it!